At Jennings, we believe laminates help homeowners convey the lifestyle and personality that they wish to exhibit with their home’s design. By constantly keeping our ears to the ground, our team ensures a constant in-flow of feedbacks and ideas to guide our laminate procurement decisions. It is a process flow that starts with everyone in Jennings collecting ideas from market research, industry experts (media and designers), and personal connections (friends and families). These data are then flowed to our laminate specialists for brainstorming sessions to understand and identify the upcoming trends and wants of designers and homeowners. Equipped with a dedicated team and selection process, Jennings is able to offer the latest design to suit every need and style, be it a polished, sophisticated look or a casual, laid back feel. Upon arrival in Jennings warehouse, each pellet of laminate receives immediate and meticulous care from our staffs. They are checked carefully for quality and external damages before being stored flat in a cool dry environment. Jennings warehouses are fitted out with fans to reduce humidity and prevent condensation, a common problem in Singapore, in order to prevent molds from growing on top of laminates. To prepare for local delivery, laminates are rolled up and tied on 2 both ends with strings to prevent bending and scratching when driving. For overseas deliveries, Jennings’ staffs take additional steps to ensure laminates arrive in excellent condition. Both ends of laminates are rolled and layered with additional cardboards before securing with cling wraps. Crates used for storing the laminates are also checked for sturdiness and termites before being covered with Styrofoam on the inside to minimize damage during travel. As environmental concerns become increasingly important, Green has become the trend in every company.More and more people are asking whether it is possible to be environmentally conscious in their businesses. Jennings shows that it is feasible with the help of environmental care standards. 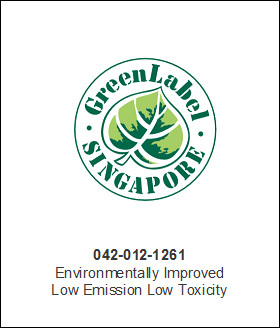 Jennings is a proud recipient of the Singapore Green Label certificate. This certifies that our products have fulfilled the requirements of low emission and low toxicity, suitable for use in environments where people spend extended periods of time. This greatly demonstrates our efforts in creating a green planet and building a home safe for everyone. 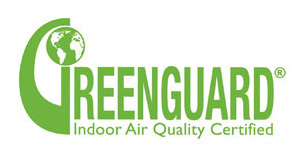 Laminates manufactured by Lamitech undergo GREENGUARD Indoor Air Quality Certification Program, a third-party verification for low emitting products. This program identifies specific products that have been tested to ensure their chemical and particle emission meets acceptable indoor air quality pollutant guidelines and standards. It is a valuable tool for architects, designers and even home owners who want to specify and purchase low-emitting products for indoor environment.